It is with great excitement and pride that the Great Plains Watercolor Society in one short year has grown to a membership of over 115 artists. We are fortunate to have a tremendous group of people that have put so much effort and enthusiasm to create this extraordinary organization. We offer our members education, networking, information sharing and other opportunities through monthly meetings, workshops lead by nationally recognized water media artists, community exhibits, newsletters and guest artists demonstrations. The Great Plains Watercolor Society is a 501c(3) nonprofit association managed by a dedicated Board and Committee of volunteers. I hope you will join us as we learn, elevate our skill as artists, make new friends and inspire others to the beauty of the wonderful medium. What a great year it has been! It is due to all of our members who have participated with great enthusiasm! The year’s activities included twelve weeks of Plein Aire painting at beautiful venues and parks. 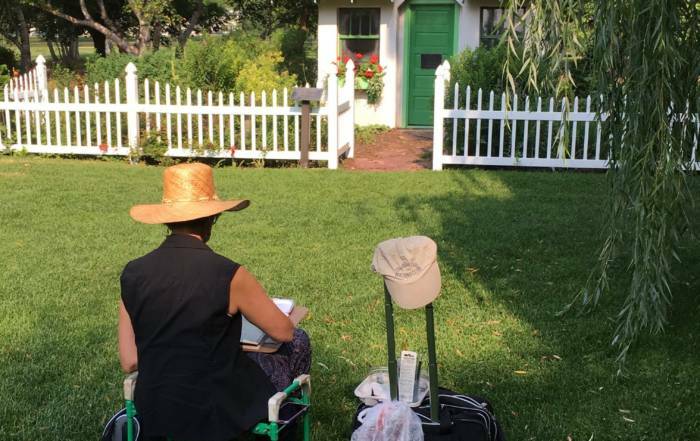 Very special plein air events included members painting with the residents of the Inn on Westport assisted living center and the patients and family of Avera Prairie Cancer Center in Sioux Falls. Our goal was to share our art with those who cannot get out to enjoy painting in nature. Both events were great successes. Probably the most popular activities were the bi-weekly paint-ins led by our members at Mosiac Studio. These classes have propelled participating members toward a whole new world of creativity and exciting and new techniques and tools. Member sharing is the bi-word of our organization and these events are key to that goal. Thanks go out to all of the member teachers who generously shared their own special art with other members. Kudos to you. All members regardless of skill were invited to display their work at two exhibits at Coffea Bistro in the summer. 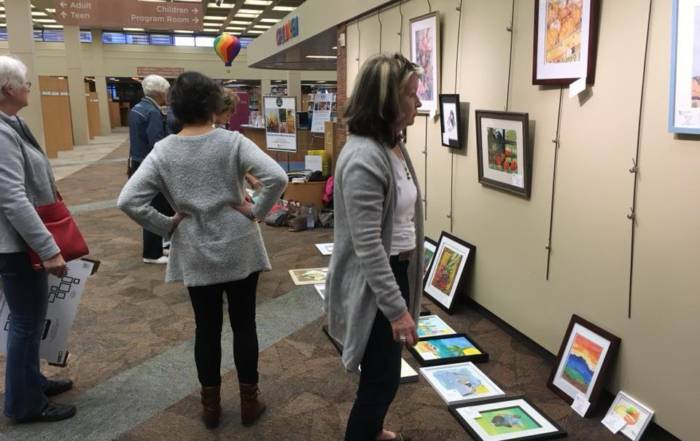 Our fall exhibition is now showing at the Sioux Land Libraries Downtown branch with 41 exceptional pieces being exhibited. The quality of the offerings from show to show has grown so much and much of that personal painting growth could points to the learning opportunities offered by the Great Plains Watercolor Society. 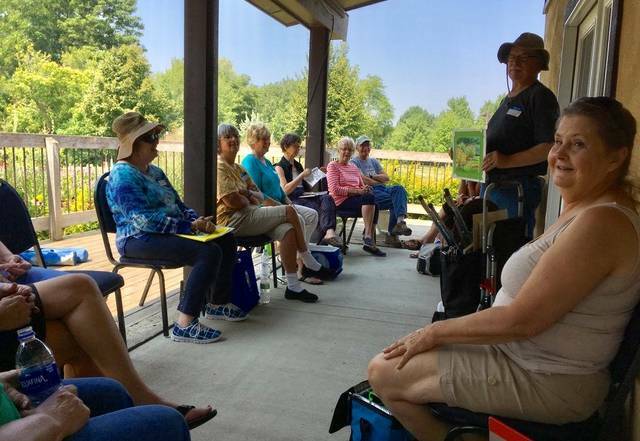 In addition to workshops offered by member instructors, the Great Plains Watercolor Society hosted two nationally recognized and award winning artists, Bonnie Cutts and Alexis Lavine at two workshops. Both of these workshops sold out quickly. Students learned valuable techniques, tools and tips as well as new ways for artists to think creatively and jumpstart their creative process. All of the workshop offerings stretched artists out of their comfort zones and elevated their skills. Our monthly meetings provided a fun way to connect with our membership and enjoy presentations by a variety of well known artists such as Ana Younger, portrait oil artist, Steve Randall, plein air landscape painter, Jennifer Stone, watercolorist and abstract artist, Kristin Peterson, mixed media, Janet Judson, batik watercolorist, and Bonnie Cutts, a Golden paint material representative and noted acrylic artist. The year ended with a special holiday celebration that in the words of those attended, “this was the best event ever! !” We have found our way to one another as we continue to enrich our lives while growing as water media artists and as an organization.